With a few changes, this kitchen has gone from non-descript functional to elegant and one any home chef would enjoy working in. Newly installed cinnamon maple cabinets add warmth, and decorative details – including handles and molding – add much-needed visual interest. The dark appliances are complemented by new cabinetry and granite countertop, which is perfect for slicing, dicing, and easy cleanup. The backsplash adds mid-tone value and movement by way of a diamond pattern overlaid on mottled brown, and a strip of stained-glass tiles adds a spot of color and additional visual interest while serving as a buffer between countertop appliances and backsplash. The drawer previously wedged between the stove and the refrigerator has been moved to the far end of the newly extended counter for easier access; and a narrow, more functional, the cabinet has been installed next to the stove. Switching white outlet plates for black completes the makeover. When you use kitchen cabinets that stand out, making a dramatic change to your home and kitchen is easy. 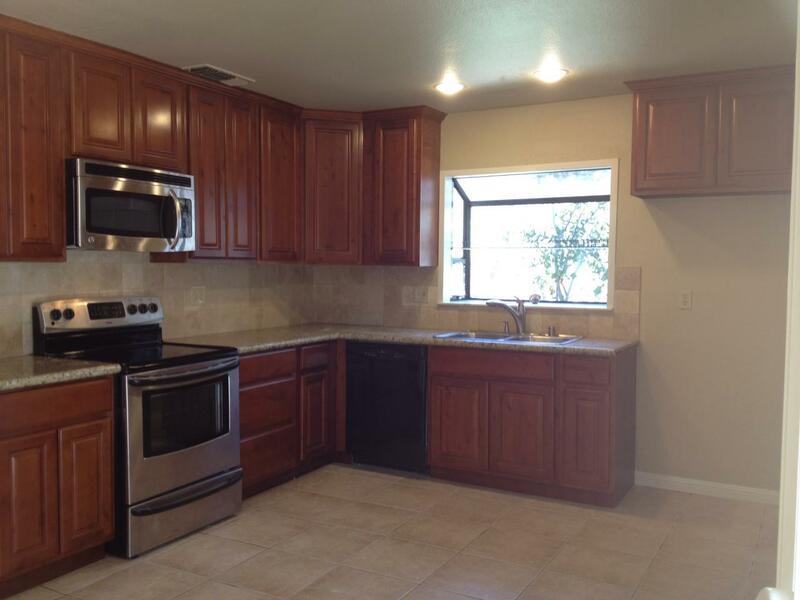 One of the fastest ways for you to improve the value of your home is with a newly remodeled kitchen. Sac City Cabinets offers a large variety of cabinets to fit the budget and needs of every customer. In this remodel, the client chose classic white allowing their new countertops to pop. These cabinets were easy to install thanks to them being pre-assembled before arriving at the home. They are well-made and fit properly with no problem getting them hung in the space due to proper measurements. All of these things add to the ease of installation and getting things done right the first time. The white cabinets and beautiful new countertop complement their stainless-steel appliances perfectly. The unique countertop ties the stainless steel and white cabinets together with a mix of grays and white. A unique backsplash brought the entire kitchen together. A cooktop added to the industrial yet modern look the customer was seeking in their new kitchen. The new recessed lighting helps to show of all the new features of the kitchen and to brighten up the room (with the addition of the white cabinets). The cabinets offer the client more storage space and open up the room to make it seem larger with the choice of white. This is a great example of how choosing the right cabinets can turn the value of a room and a home around in one remodel project. 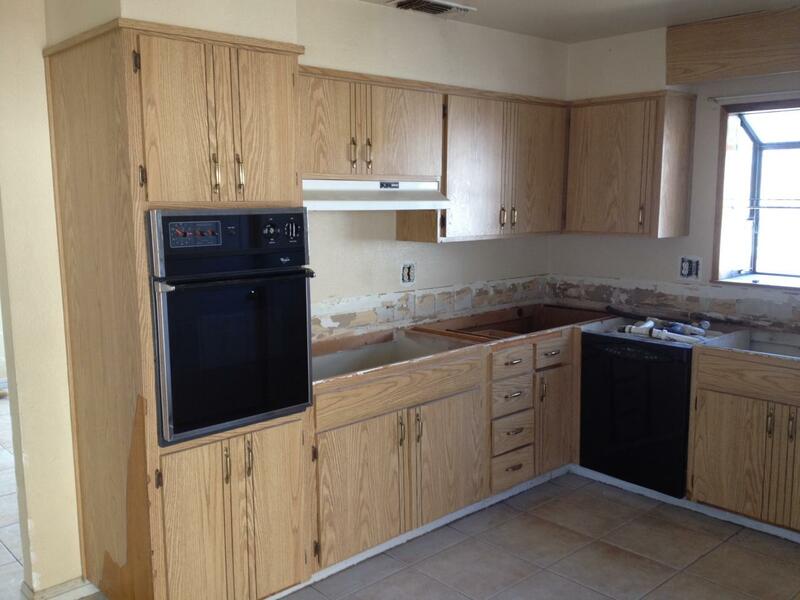 Sac City Cabinets provides custom cabinet installation. We specialize in both kitchen cabinets and bath vanities that provide personalized touches to any home. This customization allows for a more efficient use of a room in the client’s home. Visit our showroom located at 6015 Power Inn Road, Ste. K, Sacramento. We offer free estimates in 3D CAD design that is always guaranteed in writing. For questions, contact us directly at 916-369-1846.
sink was used in this design. convenience. A stove is also located in the island with adjacent dual ovens. Some storage can also be found in the island making it a great place to prep foods, cook a meal, do dishes and lately put those dishes away in the extra space within the island. dark wood floor to creating a lasting chic look to her open-concept home. For this particular kitchen remodel, the customer chose Chocolate Maple cabinets. The color complemented the color granite beautifully. The soffit was removed from the original kitchen design and recessed lighting was added for a more modern ambiances. The window, floors and appliances all stayed the same. However with the help of these beautiful cabinets from Sac City Cabinets, the room came full circle into a modern, sophisticated room in their home. The Premium cabinets offer adjustable shelves with metal shelf rests. They have full extension, under mount and steel concealed drawer glides. Each plywood box has a clear coat finish. Sac City Cabinets specializes in both kitchen cabinets and bath vanities offering a personalized touch to any type of home. Visit their showroom at 6015 Power Inn Road, Ste. K, Sacramento. They offer free estimates in 3D CAD Design, which are guaranteed in writing. For more information, call 916-369-1846. When you’re remodeling your home, you want cabinets that offer the most space, the most complimentary look to your exist decor or paint color and that fit your personal style. We offer high quality ready to install cabinets. T his particular customer remodeled both their kitchen and their bathroom. In their kitchen, they chose white shaker cabinets with brushed nickel handles and pulls for a modern yet sleek look. Gun metal appliances were installed as well as sophisticated granite counters. The recessed lighting in the ceiling and florescent lighting under the cabinets adds to the ambiance the homeowners were looking for. Hardwood floors were also installed. For this particular customer’s project, a custom design was used in order to support the cabinet over the refrigerator for the look they were seeking. In their custom bathroom remodel, they opted for Java Maple cabinets with the same brushed nickel handles and pulls from their custom kitchen. Marble counter tops were installed atop dual sinks along with matching mirrors and light fixtures. The custom cabinets offer convenient storage options throughout the room. Working with a professional kitchen design company ensures an ideal dream home experience. The experts understand what homeowners need to keep in mind when going through the remodeling experience. They also can offer professional advice on all the little things one might forget during the time-consuming process. 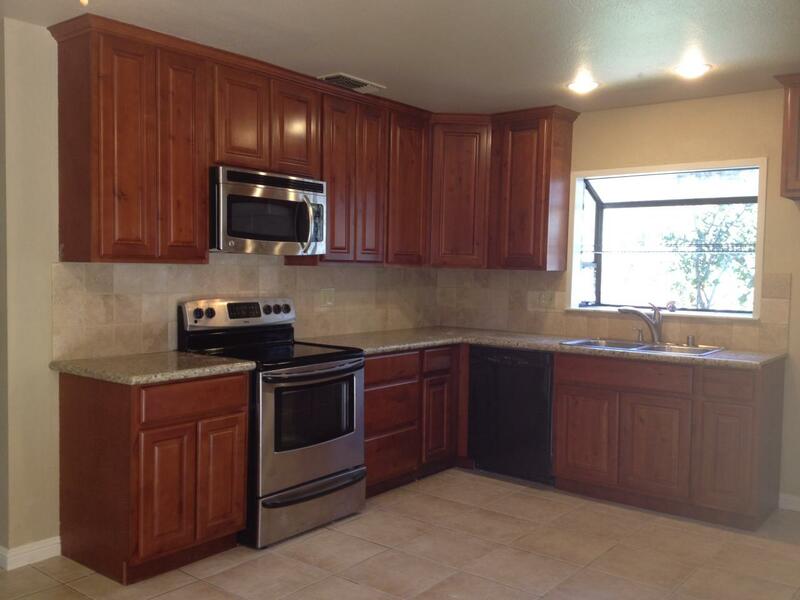 Call Sac City Cabinets today at (916)369-1846 to get started on your kitchen or bathroom remodeling project today. All of our Premium Maple Vanities are on sale NOW!!! We assemble here so there are no surprises like the other stores. Order time, 3 – 4 weeks. KEEP THE SMALL BUSINESS OWNERS ALIVE IN CALIFORNIA!!! THANK YOU!!! Looking for custom cabinets that meet your every need and go above and beyond what you were dreaming of in your home? Sac City Cabinets (formerly Builders Surplus LLC) has been helping homeowners, flippers, landlords and investors to design bathrooms and kitchens since 2007 (. Their premium cabinet offerings include: Crème Maple, Mahogany Maple, Espresso Maple, Chocolate Maple, Mocha Maple, Java Maple and Cinnamon Maple. The Sac City Cabinets’ grand opening sale offers all customers, whether new or existing clientele, premium cabinets at 40% off! Their professional staff also offers free estimates with 3D CAD designs guaranteed in writing. They believe in no games and no gimmicks and will give accurate, straightforward bids on the spot. Owners Jaci and Eric Scneder formally owned Builders Surplus LLC, which showcases their general contracting experience. They understand how difficult it can be to find discounted building materials and that reason is why Sac City Cabinets exists. Visit Sac City Cabinets at 6015 Power Inn Road, Suite K in Sacramento for a free estimate or call 916-369-1846 with any questions. Having your dream kitchen or bathroom is obtainable. Allow Sac City Cabinets to make that dream come true! If you are working with a contractor you will want to bring them to the Sac City Cabinets showroom. Working with our staff is a pleasure because we have the experience necessary to find the best fit for your project and we understand what it takes to get the most value for your money when it comes to investment property rehab projects. Together we can work with your contractor to create the perfect dream kitchen for your needs. Creating new kitchens is one of the best ways to get the very most out of your investment on any piece of property and our team is ready to help you do just that. We worked with our customer and their contractor to select the perfect cabinets for this project. The contractor for the customer commented that the cabinets were easy to install thanks to being pre-assembled. The contractor also found that the cabinets were all perfectly square, well-made and fit perfectly with no problem getting them hung in the space. The customer chose dark wood that offset the stainless steel appliances and gave the entire room a rich look. The new single action sink in stainless steel combined with a light colored tile backsplash brought new life to the kitchen. The rich colored countertops left the wood of the cabinets and the stainless steel standing out. All of the cabinets made a great combination in contrast to the light colored tiles used on the floor. The new recessed lighting helps to show off all of the new features of the kitchen and bring out the dark color of the cabinetry. The cabinets offer more storage space and open up the room to make it seem much larger. This is a great example of how taking the right cabinetry and replacing the old outdated kitchen fixtures, can turn the value of a property around. Transform your kitchen with new custom cabinets. 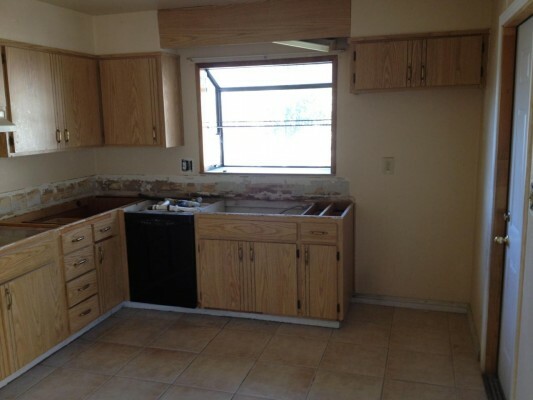 This particular homeowner did a complete remodel of their kitchen where they gutted it completely down to the studs. They knocked down a wall in the adjoining space to open up the room. They also raised the ceiling to create even more space. Some highlights of the new Tuscan, European-themed kitchen include a stacked stone faux panel pillar and a half wall. The natural oak bar top has distressed wood beams that travel all the way to the raised ceiling. The walls are a smooth, Venetian plaster texture, which adds to the overall desired look. As for lighting in the space, new lighting was installed under the counters and bar top. Recessed lighting also was installed in the room including over the bar. All of these new lights are LED and have dimmers. The new counters are a satin-finish granite (honed granite), which is an unpolished variety perfect for a natural or rustic stone look. The backsplash is tumbled travertine in a subway tile pattern, this design continues above the new range oven too. The new flooring is natural travertine to carry on the theme. The new Chocolate Maple cabinets have crown molding and an etched door. As for appliances, everything is new and GE Café. The homeowner added a gas line for the new oven. The hood of the stove is a stainless steel chimney style vent hood. The sink is a hammered copper sink with a Moen faucet.